A kitchen cutting board makes a great binding jig! 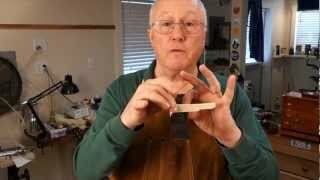 How to locate and drill a 5th peg mounting hole for banjo. 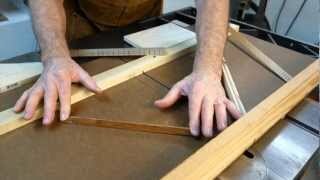 How to fit, sand, and install bridges on archtop guitars and mandolins. If you're not careful, installing new strings can create a problem that throws you out of tune or damages your bridge pin holes. Elliot John-Conry of EJC Guitars shows us an easy fix. 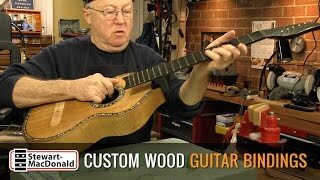 You’ve got to see this German guitar from the 1830s! Dan removed the back to repair it, and now he needs to duplicate the wood binding that’s nearly 200 years old. 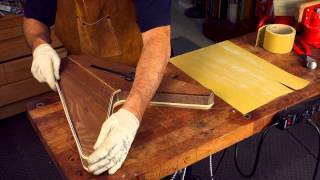 He shows how he started from a plank of walnut to create custom-sized wood binding strips. 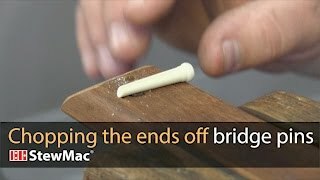 How to clamp a guitar bridge without crushing the braces inside: Dan Erlewine uses a chunk of insulation from the home improvement center. 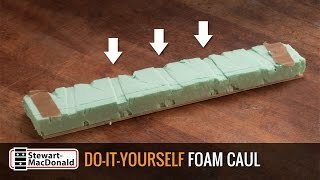 In this short video, Dan shares a trick for custom-shaping the foam to fit any guitar. Assembly instructions for the Go-bar Clamping Deck. This week, Dan Erlewine asks Todd Sams to show how a go-bar deck in his home shop turned two hours of work into twenty minutes! How to use the Guitar Screw Rescue Kit to remove small damaged screws. Tuner installation instructions using the Guitar Tuner Drill Jig. Helpful repair magnet gizmo, and 1970s Earthwood Bass! Ouch! Ouch! Ouch! These repair magnets snapped together with a CLACK!, drawing blood from Dan Erlewine's finger just as he was about to show his gizmo for avoiding pinched fingers and separating stacked magnets! 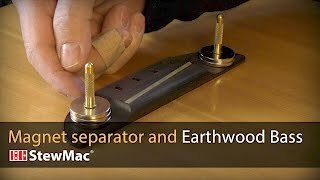 Also, Dan explains a radical bracing change on an original Earthwood acoustic bass guitar. Dan Erlewine needs to pull the tuner grommets/bushings from the peghead of this old Gibson. The lacquer is already damaged, and pulling the bushings can yank finish off too. Dan rigs a jig that holds the finish down while the bushing comes up. 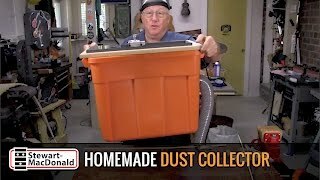 Dan Erlewine's homemade dust collection system: Dan used to go outdoors to trim binding, because without dust collection the job got really messy. That’s all changed now: Dan's homemade dust collection system is a simple plastic storage bucket turned into a downdraft routing table! Tuner installation instructions using the Mandolin Tuner Drill Jig. Set up instructions for the Purfling/Soundhole Router Guide. 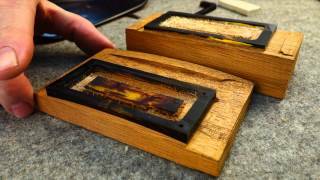 After nearly 60 years, old celluloid parts start to crumble. The pickup risers on a '55 Gretsch are rotting away, and Dan Erlewine builds new replacements from a sheet of tortoiseshell pickguard plastic. The Saddle Routing Jig lets you slot a new bridge with a traditional single saddle or 2-piece compensated saddle, fill and move an existing saddle slot, widen a saddle slot for a compensated saddle, or flatten the bottom of the slot for a saddle transducer pickup. Instructions for using a Self-adhesive Sanding Disc with a Concave Radius Dish. Link Van Cleave is a sharp guy! He taught tool sharpening at the 2013 Northwoods Seminar. 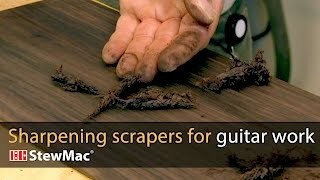 That was a class on professional techniques, but Link also gave us this foolproof Trade Secret for making your favorite scraper super-sharp. Repair cracks in tops and sides of an acoustic guitar. A make-it-yourself solution for fast accurate 90 degree cuts on your table saw. Also a cool tip on making bendy, flexible cauls that follow the shapes on a guitar. Instructions for drilling pegholes for classical and steel string tuners. 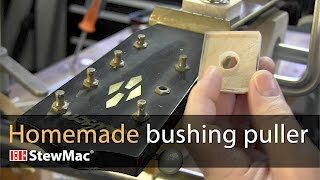 How to install tuners with set pins (as opposed to screws) with the Tuner Pin Drill Jig.